Yes, it is getting down to the wire for my entry in the McCall’s Design Star Challenge ! But the end is in sight. A special thanks to Fran and Murray at The Patchwork Co. in Windham, NY. for shipping out some more supplies to me on Christmas Eve. The fabric arrived on Monday (despite the blizzard in NYC!) and I have been busy sewing. I have some log cabin borders that I am playing around with. I am trying to decide on what shade of yellow/gold to use to make things pop a bit. 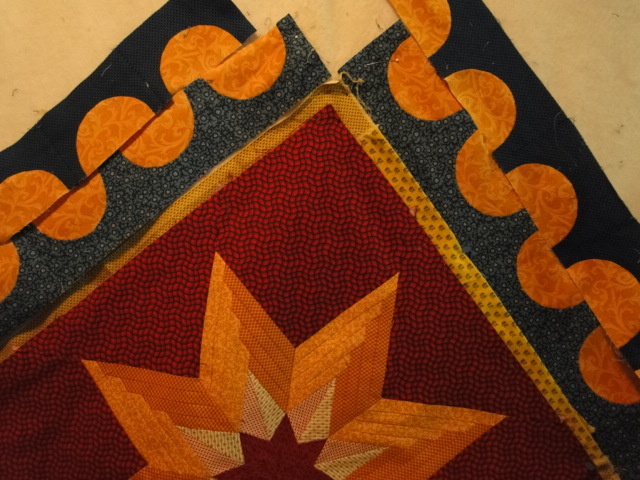 Finish the quilt today and get it on the Handiquilter – and stabilize it (quilt in the ditch). 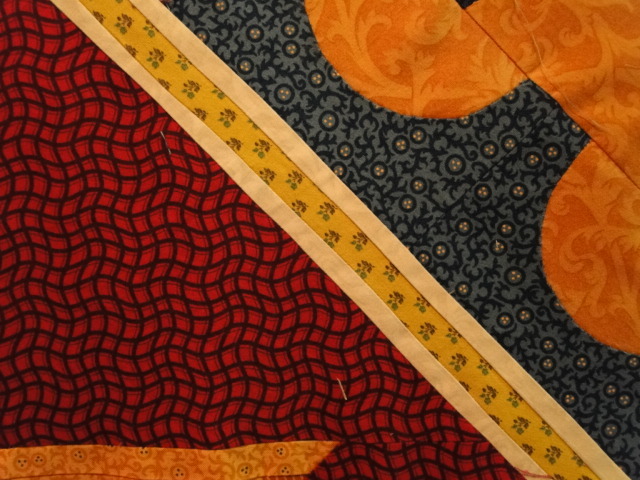 If I am not too tired I will do some quilting tonight. Saturday – I am having a binding party – Some friends are coming over – everyone will take a side of the quilt and stitch the binding down. Sunday – Do any last minute fixes that might be needed and box it up. Monday – Ship it overnight mail to McCall’s in Colorado. Have a celebration dinner! 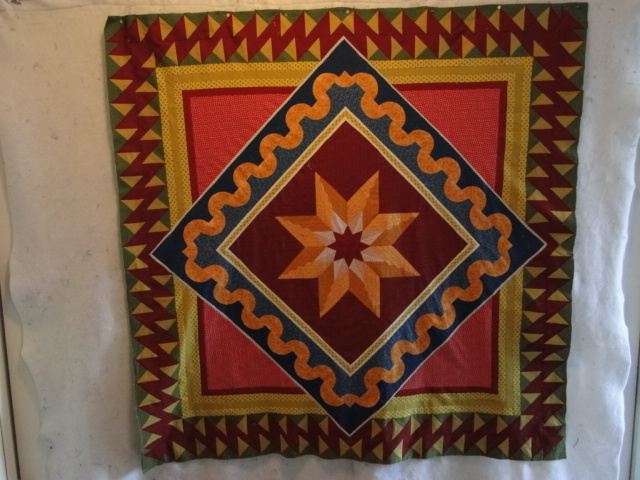 Well, I had to work all weekend playing Christmas Services at church, so not much sewing got done – and I ran out of some fabric for my entry in the McCall’s Design Star Challenge . I am waiting (hoping the post office can get through the snow today in NYC) for the order I placed on Friday from The Patchwork Co. in Windham, NY. I tried one color way for the next set of borders and didn’t like it. Then I tried this new color way and like the way it looks. Today – I will finish this border and the triangle sections and (fingers crossed) start on the final border of log cabins. Tomorrow – it is a log cabin border day! 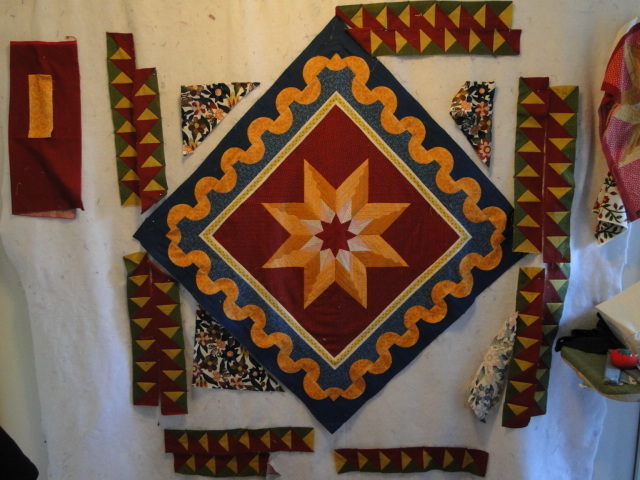 Here is what has been accomplished today for my quilt in the McCall’s Design Star Challenge. I added a 1 inch border around the central medallion (.25 of white, .5 of gold, .25 of white) and then added the 2 borders of half circles. 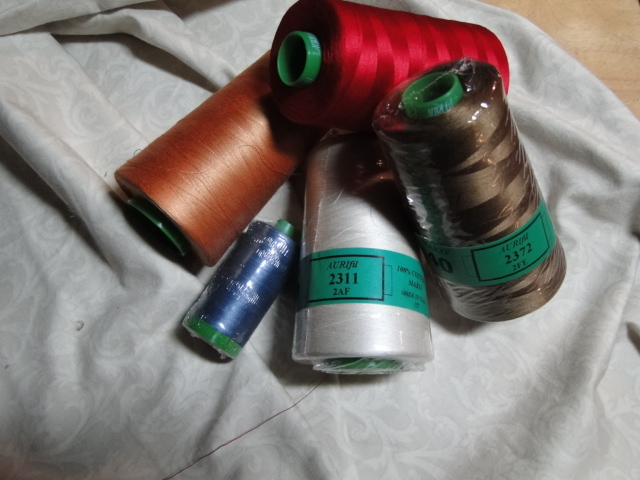 The Aurifil Thread to quilt the quilt is here thanks to the everyone at Bigfork Bay Cotton Company and Follow that Thread. 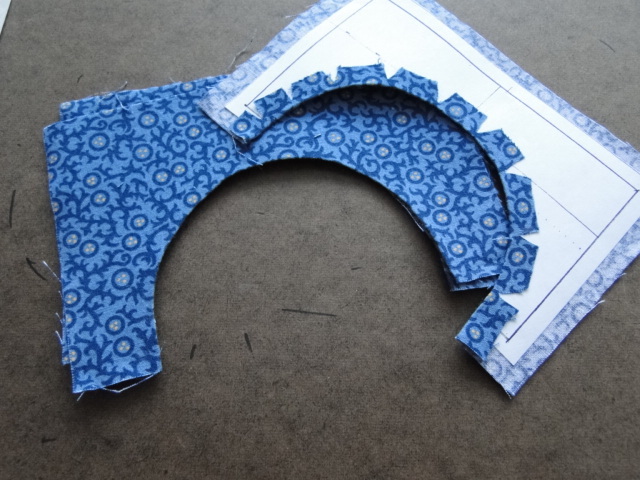 OK – back to the rotary cutter and the sewing Machine! My revised schedule for the McCall’s Design Star Competition gives me 9 days to complete the entire quilt – can it be done??? Well, it has to be done – so YES! My goal is to ship it out no later than December 30th. A recap of where I was yesterday morning. 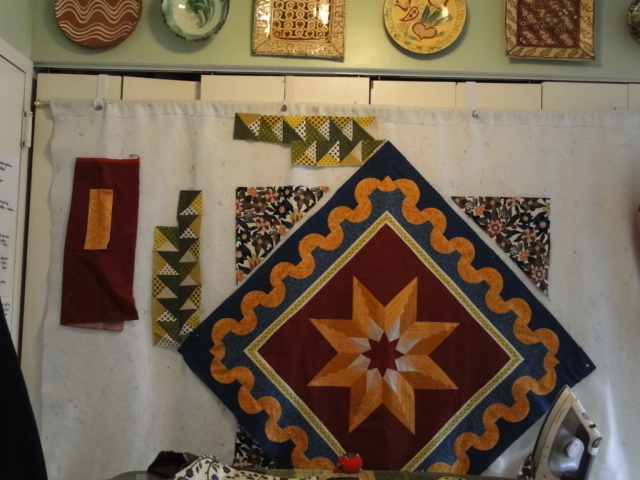 This is what the quilt looked like on the wall yesterday morning. And I still had several applique blocks to complete. 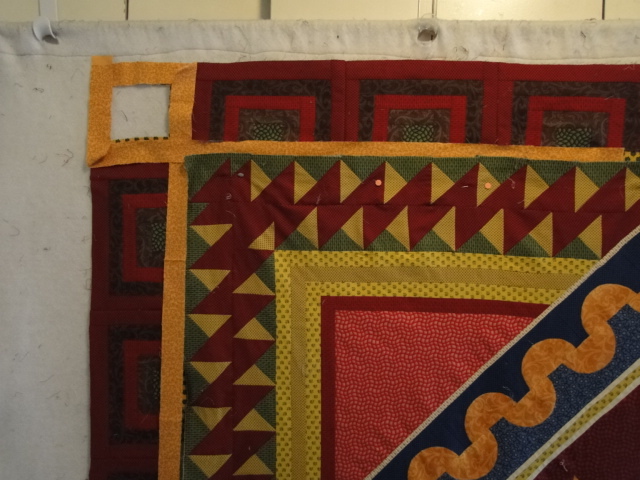 Here is a close up of the border – the two rows are not yet sewn together.. I am testing out some colors for some spacer borders to adjust for the difference between the central medallion and the border. This morning I plan on attaching the spacer borders. 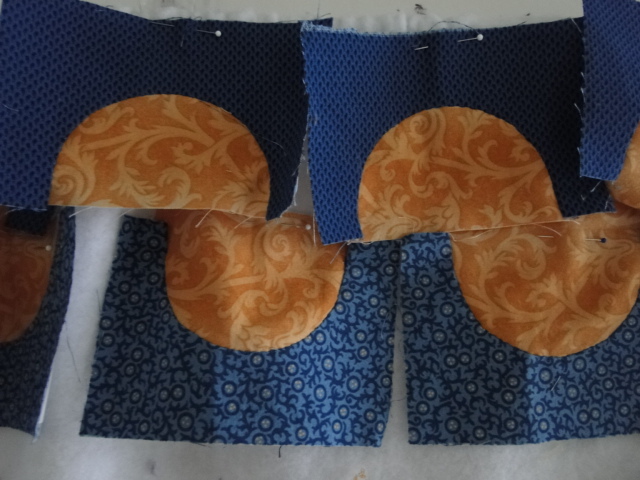 I am also going to prep the four inner corner blocks so that I can turn the corner – I am going to use the same blue fabric with a gold circle in the center. 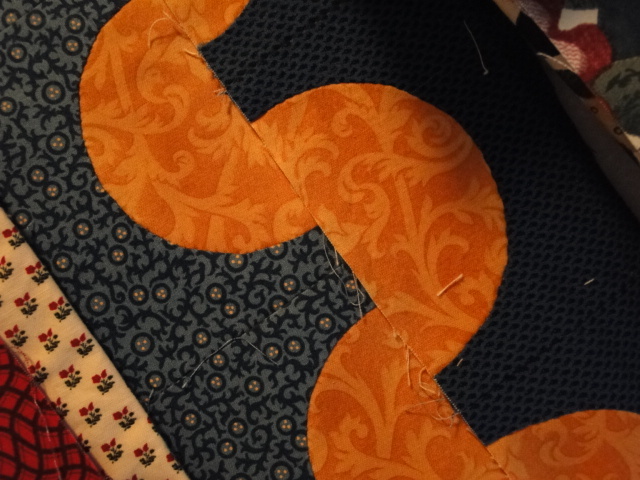 I am still playing around with a few ideas of how to turn the corner on the outer/darker border. 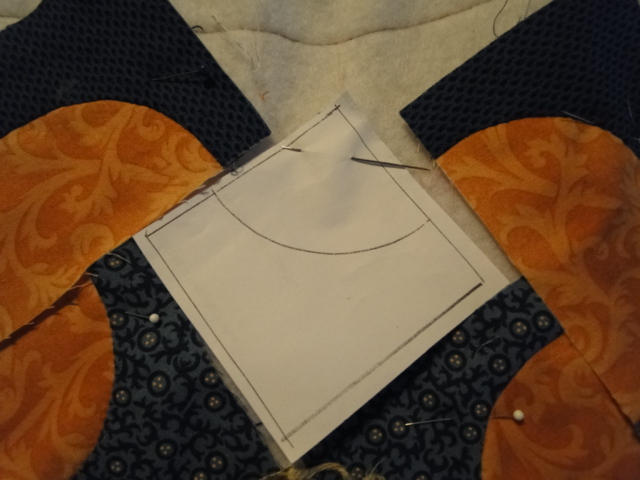 Here is a picture of the paper template positioned in place to give you an idea of how iI will turn the corner on the inner border. I have to head off to the last rehearsals with the choirs before Christmas – so not a lot of sewing is going to get done today. I hope the spirit of Santa’s Elves (that means all of you!) 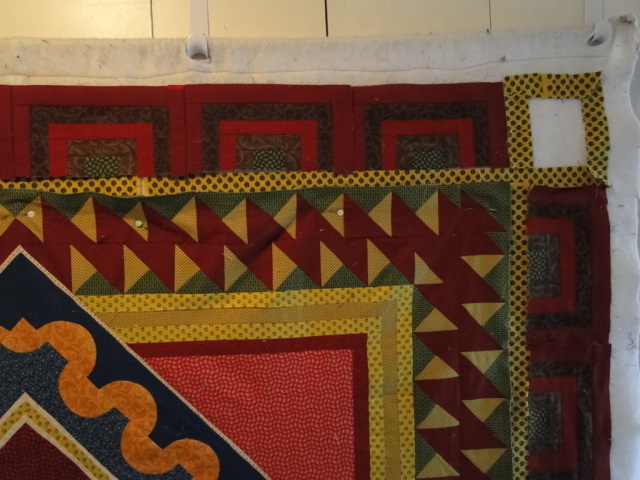 will be in my sewing room in spirit on Wednesday to help me push through so that I can finish this quilt. Goal: Finish the top by Dec 23rd! Wish me luck! 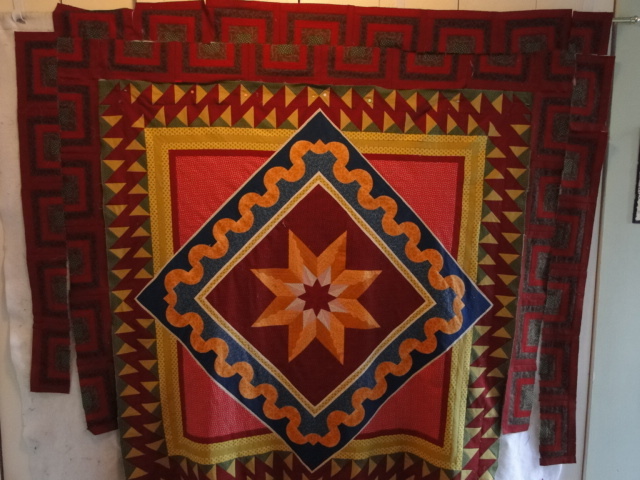 Some of you have asked about patterns for the quilts I have had in the competition. I am going to work on writing up the patterns after the first of the year – I will keep you posted about when/where they will be available. 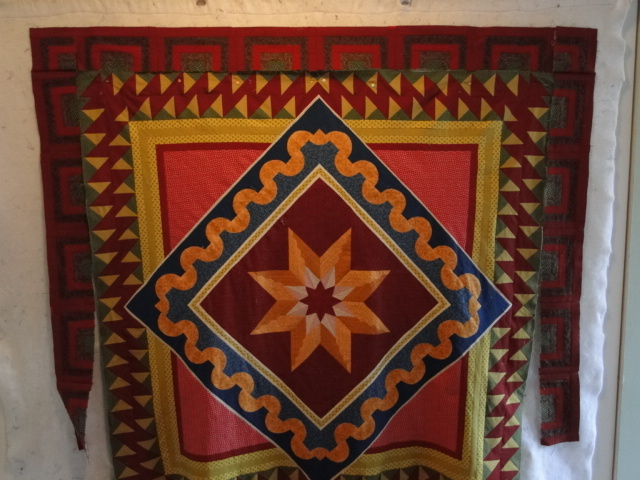 In January I will give more background about Medallion Quilts – their history and development and resources that I found helpful in creating this quilt. 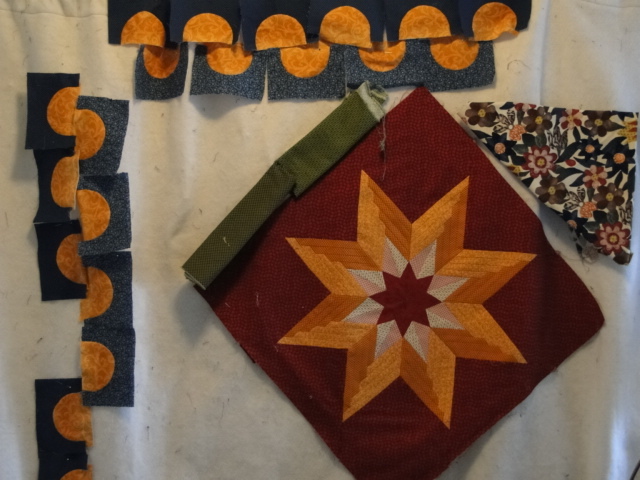 OK – a few of you wrote to me to say that I was making you nervous about my finishing the quilt for the McCall’s Design Star Challenge – so if you were nervous last week – hang onto your seats this week. 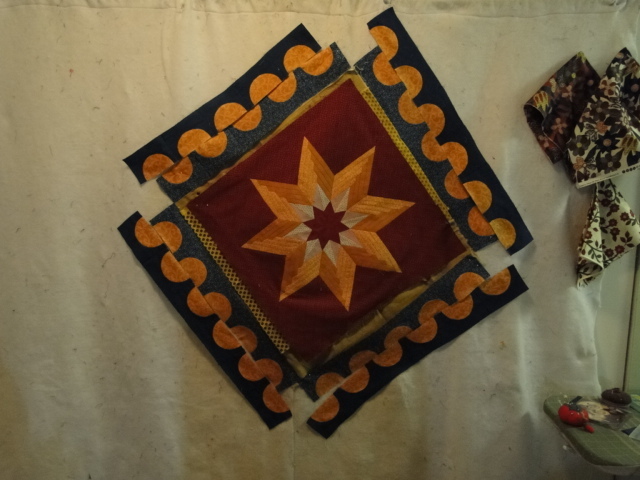 I am behind, but the plan is revised.I canceled my out of town trip to visit family next week – they said – “We were wondering how I was going to get the quilt done and come and visit later”. I called in reinforcements for some help – and I might do that again. 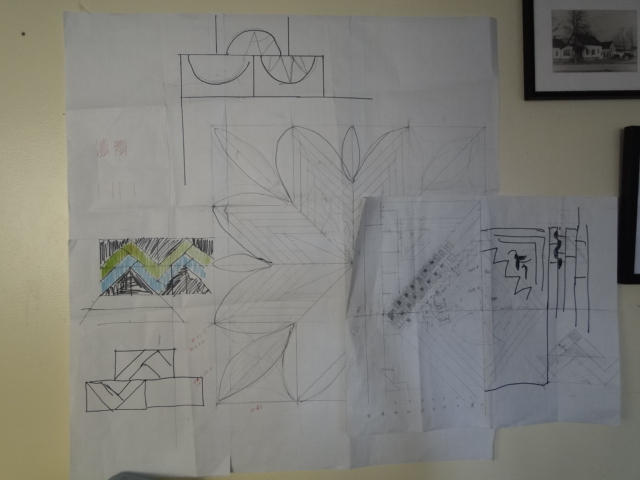 Here are two drawings of the quilt that are up on the wall and are a place that I go to scribble from time to time. Here is a picture of my design wall as it looks this morning. 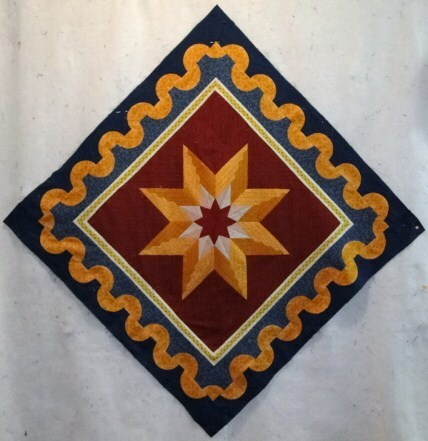 I remade the star medallion so that the fabrics in the split diamonds were angled in the same direction in all the points. Yes, fussy cutting. And I added a different background fabric to make the star pop out a bit more. 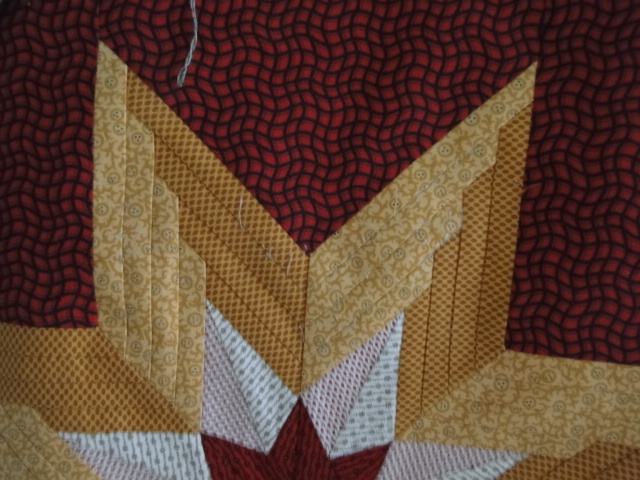 Here is a close up of the paper pieced star point – stray threads are from another piece of fabric on the wall. 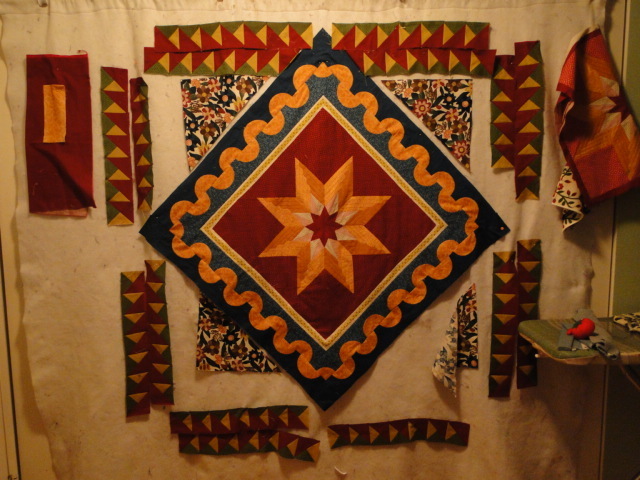 Now – today – finish the applique, sew the border around the star, and hopefully get the corner triangle blocks done! 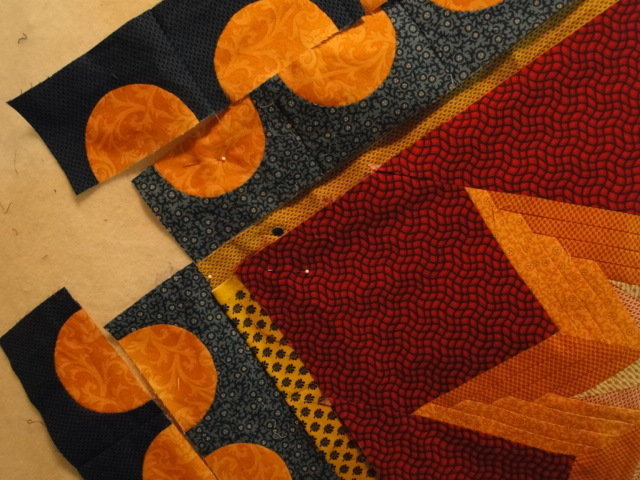 Anyone in NYC next week – would you like to come by and take a side of the quilt and help me stitch the binding down.